It is a fact. The New Mexico Constitution states that New Mexico is a bilingual (English- and Spanish-language) state, and specifies also that the many indigenous languages spoken in the state are officially protected as an integral part of New Mexico's diverse culture. New Mexico has, per capita, the highest number of Latino residents in the United States. Among New Mexico's diverse population, whites are outnumbered by Latino and Native American residents. 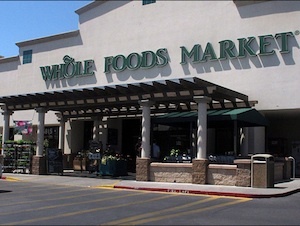 In the last month, two workers at Whole Foods Market in Albuquerque, plus local high school athletes, have been reprimanded and/or suspended from activities simply for speaking Spanish. Whole Foods Market worker Bryan Baldizan along with a woman employee were suspended by Whole Foods for simply complaining that they could not speak Spanish to each other while on the job. "I couldn't believe it," said Baldizan, who works in the store's food preparation department. "All we did was say we didn't believe the policy was fair. We only talk Spanish to each other about personal stuff, not work." The suspension of the two Whole Foods workers comes after two recent cases in Albuquerque of Spanish being barred from student athletic competitions. This included the penalizing last month of José Gonzáles, a tennis player at the New Mexico Military Institute, for speaking Spanish after being warned by officials to only speak English during a tennis match, in violation of the state constitution. In April, after an umpire tried to ban high school baseball players from speaking Spanish, the umpire was forced to resign after a public outcry and an intervention on behalf of the students from school officials. In response, the New Mexico League of United Latin American Citizens spoke out strongly against the racism of Whole Foods Market's policies, threatening to boycott any businesses that attempt to ban workers from speaking Spanish.